Navigation, iPod/MP3 Input, Bluetooth, Back-Up Camera, URBANA CABRIO APPEARANCE PACKAGE, POPULAR EQUIPMENT PACKAGE, NAVIGATION & SATELLITE PACKAGE, Turbo Charged. EPA 33 MPG Hwy/28 MPG City! Pompei Silver exterior, Pop trim AND MORE! KEY FEATURES INCLUDE Back-Up Camera, Turbocharged, iPod/MP3 Input, Bluetooth MP3 Player, Keyless Entry, Steering Wheel Controls, Heated Mirrors, Electronic Stability Control. OPTION PACKAGES BEATS PREMIUM AUDIO SYSTEM, NAVIGATION & SATELLITE PACKAGE GPS Navigation, For More Info, Call 800-643-2112, 1-Yr SiriusXM Radio Service, SiriusXM Satellite Radio, URBANA CABRIO APPEARANCE PACKAGE Instrument Panel Black Bezel, Side Sills Ground Effects, Silver Accent Stitching, Wheels: 16 x 6.5 Hyper-Black Aluminum, Black Trimmed Lights, POPULAR EQUIPMENT PACKAGE ATC Air Conditioning w/Micron Filter, Rear View Auto Dim Mirror w/Microphone, TRANSMISSION: 5-SPEED C510 MANUAL (STD). VEHICLE REVIEWS Great Gas Mileage: 33 MPG Hwy. BUY FROM AN AWARD WINNING DEALER Central Maine Motors Auto Group has been proudly serving the community since 1935. We do not charge documentation fees, we provide a full tank of gas whether you choose to purchase a new or pre-owned vehicle as well as complimentary, lifetime Maine State Inspections. Please confirm the accuracy of the included equipment by calling us prior to purchase. Grigio Argento (Grey Metallic) exterior, Trekking trim. EPA 29 MPG Hwy/21 MPG City! Bluetooth, Remote Engine Start, All Wheel Drive, QUICK ORDER PACKAGE 28G, Aluminum Wheels, iPod/MP3 Input, Satellite Radio, Back-Up Camera CLICK NOW! KEY FEATURES INCLUDE All Wheel Drive, Back-Up Camera, Satellite Radio, iPod/MP3 Input, Bluetooth, Aluminum Wheels, Remote Engine Start. Rear Spoiler, MP3 Player, Keyless Entry, Privacy Glass, Steering Wheel Controls. OPTION PACKAGES QUICK ORDER PACKAGE 28G. VEHICLE REVIEWS KBB.com explains If you love the individuality and colorful expression of small European cars, but need something that can handle snow and ice, delivers good fuel economy and doesn't cost an arm and a leg, the 2018 Fiat 500X could be the little Italian for you.. Great Gas Mileage: 29 MPG Hwy. OUR OFFERINGS Central Maine Motors Auto Group has been proudly serving the community since 1935. We do not charge documentation fees, we provide a full tank of gas whether you choose to purchase a new or pre-owned vehicle as well as complimentary, lifetime Maine State Inspections. Please confirm the accuracy of the included equipment by calling us prior to purchase. FUEL EFFICIENT 29 MPG Hwy/21 MPG City! Bianco Gelato (White Clear Coat) exterior, Trekking trim. Bluetooth, Remote Engine Start, All Wheel Drive, QUICK ORDER PACKAGE 28G, Aluminum Wheels, iPod/MP3 Input, Satellite Radio AND MORE! KEY FEATURES INCLUDE All Wheel Drive, Back-Up Camera, Satellite Radio, iPod/MP3 Input, Bluetooth, Aluminum Wheels, Remote Engine Start Rear Spoiler, MP3 Player, Keyless Entry, Privacy Glass, Steering Wheel Controls. OPTION PACKAGES QUICK ORDER PACKAGE 28G. EXPERTS ARE SAYING KBB.com explains If you love the individuality and colorful expression of small European cars, but need something that can handle snow and ice, delivers good fuel economy and doesn't cost an arm and a leg, the 2018 Fiat 500X could be the little Italian for you.. Great Gas Mileage: 29 MPG Hwy. OUR OFFERINGS Central Maine Motors Auto Group has been proudly serving the community since 1935. We do not charge documentation fees, we provide a full tank of gas whether you choose to purchase a new or pre-owned vehicle as well as complimentary, lifetime Maine State Inspections. Please confirm the accuracy of the included equipment by calling us prior to purchase. EPA 29 MPG Hwy/21 MPG City! Bianco Gelato (White Clear Coat) exterior, Trekking trim. Bluetooth, Remote Engine Start, All Wheel Drive, QUICK ORDER PACKAGE 28G, Alloy Wheels, iPod/MP3 Input, Satellite Radio, Back-Up Camera CLICK NOW! KEY FEATURES INCLUDE All Wheel Drive, Back-Up Camera, Satellite Radio, iPod/MP3 Input, Bluetooth, Aluminum Wheels, Remote Engine Start. Rear Spoiler, MP3 Player, Keyless Entry, Privacy Glass, Steering Wheel Controls. OPTION PACKAGES QUICK ORDER PACKAGE 28G. EXPERTS REPORT KBB.com explains If you love the individuality and colorful expression of small European cars, but need something that can handle snow and ice, delivers good fuel economy and doesn't cost an arm and a leg, the 2018 Fiat 500X could be the little Italian for you.. Great Gas Mileage: 29 MPG Hwy. WHY BUY FROM US Central Maine Motors Auto Group has been proudly serving the community since 1935. We do not charge documentation fees, we provide a full tank of gas whether you choose to purchase a new or pre-owned vehicle as well as complimentary, lifetime Maine State Inspections. Please confirm the accuracy of the included equipment by calling us prior to purchase. Sunroof, Bluetooth, Remote Engine Start, Alloy Wheels, QUICK ORDER PACKAGE 28C BLUE SKY EDIT... POPULAR EQUIPMENT GROUP, iPod/MP3 Input. Blue Sky Edition trim, Blue Sky Metallic exterior. FUEL EFFICIENT 29 MPG Hwy/21 MPG City! READ MORE! KEY FEATURES INCLUDE All Wheel Drive, Back-Up Camera, iPod/MP3 Input, Bluetooth, Dual Moonroof, Aluminum Wheels, Remote Engine Start Rear Spoiler, Keyless Entry, Steering Wheel Controls, Heated Mirrors, Electronic Stability Control. OPTION PACKAGES QUICK ORDER PACKAGE 28C BLUE SKY EDITION Painted Sill Molding w/Satin Chrome, Satin Chrome Exterior Mirrors, Fog & Cornering Lights, Automatic Headlamps, Exterior Accents-Satin Chrome, Satin Silver Door Handles, Blue Sky Edition, Instrument Panel Bezels-Blue, POPULAR EQUIPMENT GROUP Premium Wrapped Steering Wheel, For More Info, Call 800-643-2112, Remote USB Port, Front & Rear Floor Mats, 1-Yr SiriusXM Radio Service, ParkSense Rear Park Assist System, SiriusXM Satellite Radio. EXPERTS CONCLUDE If you love the individuality and colorful expression of small European cars, but need something that can handle snow and ice, delivers good fuel economy and doesn't cost an arm and a leg, the 2018 Fiat 500X could be the little Italian for you. -KBB.com. Great Gas Mileage: 29 MPG Hwy. OUR OFFERINGS Central Maine Motors Auto Group has been proudly serving the community since 1935. We do not charge documentation fees, we provide a full tank of gas whether you choose to purchase a new or pre-owned vehicle as well as complimentary, lifetime Maine State Inspections. Please confirm the accuracy of the included equipment by calling us prior to purchase. 3rd Row Seat, Dual Zone A/C, Fourth Passenger Door, Rear Air, TRANSMISSION: 6-SPEED AUTOMATIC 62TE, ENGINE: 3.6L V6 24V VVT, CD Player, iPod/MP3 Input. Black Onyx Crystal Pearl Coat exterior, SE trim. EPA 25 MPG Hwy/17 MPG City! READ MORE! KEY FEATURES INCLUDE Third Row Seat, Rear Air, Back-Up Camera, iPod/MP3 Input, CD Player, Dual Zone A/C, Fourth Passenger Door. Rear Spoiler, MP3 Player, Third Passenger Door, Keyless Entry, Privacy Glass. OPTION PACKAGES ENGINE: 3.6L V6 24V VVT, TRANSMISSION: 6-SPEED AUTOMATIC 62TE (STD). VEHICLE REVIEWS TheCarConnection.com explains In front, the Grand Caravan gives its passengers a high seating position, decent adjustment, and excellent outward vision.. Great Gas Mileage: 25 MPG Hwy. WHO WE ARE Central Maine Motors Auto Group has been proudly serving the community since 1935. We do not charge documentation fees, we provide a full tank of gas whether you choose to purchase a new or pre-owned vehicle as well as complimentary, lifetime Maine State Inspections. Please confirm the accuracy of the included equipment by calling us prior to purchase. Nav System, Heated Leather Seats, iPod/MP3 Input, Bluetooth, BEATS PREMIUM AUDIO SYSTEM, GPS NAVIGATION, Aluminum Wheels. Lounge trim, Bianco White Ice exterior and Nero (Black) interior. FUEL EFFICIENT 33 MPG Hwy/28 MPG City! AND MORE! KEY FEATURES INCLUDE Leather Seats, Heated Driver Seat, Back-Up Camera, Turbocharged, Satellite Radio, iPod/MP3 Input, Bluetooth, Aluminum Wheels, Heated Seats, Heated Leather Seats. MP3 Player, Keyless Entry, Steering Wheel Controls, Electronic Stability Control, Heated Mirrors. OPTION PACKAGES TRANSMISSION: 6-SPEED AISIN F21-250 HD AUTOMATIC 3.502 Final Drive Ratio, BEATS PREMIUM AUDIO SYSTEM, GPS NAVIGATION. FIAT Lounge with Bianco White Ice exterior and Nero (Black) interior features a 4 Cylinder Engine with 135 HP at 5500 RPM*. VEHICLE REVIEWS Great Gas Mileage: 33 MPG Hwy. MORE ABOUT US Central Maine Motors Auto Group has been proudly serving the community since 1935. We do not charge documentation fees, we provide a full tank of gas whether you choose to purchase a new or pre-owned vehicle as well as complimentary, lifetime Maine State Inspections. Please confirm the accuracy of the included equipment by calling us prior to purchase. Third Row Seat, CD Player, Dual Zone A/C, Fourth Passenger Door, ENGINE: 3.6L V6 24V VVT, TRANSMISSION: 6-SPEED AUTOMATIC 62TE, Quad Bucket Seats. FUEL EFFICIENT 25 MPG Hwy/17 MPG City! Indigo Blue Clear Coat exterior, SE trim CLICK NOW! KEY FEATURES INCLUDE Third Row Seat, Rear Air, Back-Up Camera, iPod/MP3 Input, CD Player, Dual Zone A/C, Fourth Passenger Door Rear Spoiler, MP3 Player, Privacy Glass, Keyless Entry. OPTION PACKAGES 2ND ROW STOW 'N GO BUCKET SEATS 3rd Row Stow 'N Go w/Tailgate Seats, ENGINE: 3.6L V6 24V VVT, TRANSMISSION: 6-SPEED AUTOMATIC 62TE (STD). VEHICLE REVIEWS Great Gas Mileage: 25 MPG Hwy. MORE ABOUT US Central Maine Motors Auto Group has been proudly serving the community since 1935. We do not charge documentation fees, we provide a full tank of gas whether you choose to purchase a new or pre-owned vehicle as well as complimentary, lifetime Maine State Inspections. Please confirm the accuracy of the included equipment by calling us prior to purchase. Tradesman trim, Bright White exterior. Fourth Passenger Door, Brake Actuated Limited Slip Differential, Bluetooth, ENGINE: 2.4L I4 MULTIAIR, QUICK ORDER PACKAGE 24C TRADESMAN CAR... FUEL EFFICIENT 28 MPG Hwy/21 MPG City! CLICK ME! KEY FEATURES INCLUDE Back-Up Camera, iPod/MP3 Input, Bluetooth, Fourth Passenger Door, Brake Actuated Limited Slip Differential. MP3 Player, Keyless Entry, Child Safety Locks, Electronic Stability Control. OPTION PACKAGES SPEED CONTROL, QUICK ORDER PACKAGE 24C TRADESMAN CARGO VAN Engine: 2.4L I4 MultiAir, Transmission: 9-Speed 948TE Automatic, Supplemental Side Curtain Front Air Bags, ENGINE: 2.4L I4 MULTIAIR (STD), TRANSMISSION: 9-SPEED 948TE AUTOMATIC (STD). EXPERTS ARE SAYING Great Gas Mileage: 28 MPG Hwy. MORE ABOUT US Central Maine Motors Auto Group has been proudly serving the community since 1935. We do not charge documentation fees, we provide a full tank of gas whether you choose to purchase a new or pre-owned vehicle as well as complimentary, lifetime Maine State Inspections. Please confirm the accuracy of the included equipment by calling us prior to purchase. FUEL EFFICIENT 28 MPG Hwy/21 MPG City! Bright White exterior, Tradesman trim. Fourth Passenger Door, Brake Actuated Limited Slip Differential, Bluetooth, ENGINE: 2.4L I4 MULTIAIR, QUICK ORDER PACKAGE 24C TRADESMAN CAR... SEE MORE! KEY FEATURES INCLUDE Back-Up Camera, iPod/MP3 Input, Bluetooth, Fourth Passenger Door, Brake Actuated Limited Slip Differential. MP3 Player, Keyless Entry, Child Safety Locks, Electronic Stability Control. OPTION PACKAGES SPEED CONTROL, QUICK ORDER PACKAGE 24C TRADESMAN CARGO VAN Engine: 2.4L I4 MultiAir, Transmission: 9-Speed 948TE Automatic, Supplemental Side Curtain Front Air Bags, ENGINE: 2.4L I4 MULTIAIR (STD), TRANSMISSION: 9-SPEED 948TE AUTOMATIC (STD). EXPERTS RAVE Great Gas Mileage: 28 MPG Hwy. VISIT US TODAY Central Maine Motors Auto Group has been proudly serving the community since 1935. We do not charge documentation fees, we provide a full tank of gas whether you choose to purchase a new or pre-owned vehicle as well as complimentary, lifetime Maine State Inspections. Please confirm the accuracy of the included equipment by calling us prior to purchase. NAV, Heated Seats, Sunroof, Dual Zone A/C, Remote Engine Start, Back-Up Camera, LOUNGE PREMIUM PACKAGE (AWD), All Wheel Drive. Lounge trim, Nero Cinema (Black Clear Coat) exterior. FUEL EFFICIENT 29 MPG Hwy/21 MPG City! CLICK ME! KEY FEATURES INCLUDE Navigation, All Wheel Drive, Heated Driver Seat, Back-Up Camera, Satellite Radio, iPod/MP3 Input, Bluetooth, Remote Engine Start, Dual Zone A/C, Heated Seats Rear Spoiler, MP3 Player, Keyless Entry, Privacy Glass, Steering Wheel Controls. OPTION PACKAGES LOUNGE PREMIUM PACKAGE (AWD) Dual-Pane Power Sunroof, Wheels: 18 x 7.0 Aluminum, Tires: 215/55R18 All Season, Beats Premium Audio System. EXPERTS ARE SAYING If you love the individuality and colorful expression of small European cars, but need something that can handle snow and ice, delivers good fuel economy and doesn't cost an arm and a leg, the 2018 Fiat 500X could be the little Italian for you. -KBB.com. Great Gas Mileage: 29 MPG Hwy. MORE ABOUT US Central Maine Motors Auto Group has been proudly serving the community since 1935. We do not charge documentation fees, we provide a full tank of gas whether you choose to purchase a new or pre-owned vehicle as well as complimentary, lifetime Maine State Inspections. Please confirm the accuracy of the included equipment by calling us prior to purchase. 3rd Row Seat, CD Player, iPod/MP3 Input, Fourth Passenger Door, Dual Zone A/C, TRANSMISSION: 6-SPEED AUTOMATIC 62TE, ENGINE: 3.6L V6 24V VVT (FFV). EPA 25 MPG Hwy/17 MPG City! Octane Red Pearl Coat exterior, SE Plus trim READ MORE! KEY FEATURES INCLUDE Third Row Seat, Rear Air, Back-Up Camera, iPod/MP3 Input, CD Player, Aluminum Wheels, Dual Zone A/C, Fourth Passenger Door. Rear Spoiler, Third Passenger Door, Keyless Entry, Privacy Glass, Child Safety Locks. OPTION PACKAGES QUICK ORDER PACKAGE 29H SE PLUS Engine: 3.6L V6 24V VVT (FFV), Transmission: 6-Speed Automatic 62TE, Floor Console w/Cupholder, Instrument Panel w/Piano Black Applique, Blacktop Package, Gloss Black Grille, Silver Accent Stitching, Black Headlamp Bezels, Front Fog Lamps, Rear Fascia Scuff Pad, Highline Door Trim Panel, Automatic Headlamps, Premium Interior Accents, Remote Start System, Security Alarm, Security Group, Leather Wrapped Shift Knob, Uconnect Voice Command w/Bluetooth, Bluetooth Streaming Audio, Remote USB Port, Leather Wrapped Steering Wheel, Sirius Satellite Radio, 1-Yr SiriusXM Radio Service, For More Info, Call 888-539-7474, 2ND ROW STOW'N GO BUCKET SEATS 3rd Row Stow 'N Go w/Tailgate Seats, ENGINE: 3.6L V6 24V VVT (FFV) (STD), TRANSMISSION: 6-SPEED AUTOMATIC 62TE (STD). EXPERTS REPORT Great Gas Mileage: 25 MPG Hwy. BUY FROM AN AWARD WINNING DEALER Central Maine Motors Auto Group has been proudly serving the community since 1935. We do not charge documentation fees, we provide a full tank of gas whether you choose to purchase a new or pre-owned vehicle as well as complimentary, lifetime Maine State Inspections. Please confirm the accuracy of the included equipment by calling us prior to purchase. Nav System, Heated Seats, iPod/MP3 Input, Bluetooth, TRANSMISSION: 6-SPEED AISIN F21-250 H... BEATS AUDIO PACKAGE, POPULAR EQUIPMENT PACKAGE. Granito Gray exterior, Abarth trim. FUEL EFFICIENT 33 MPG Hwy/28 MPG City! CLICK ME! KEY FEATURES INCLUDE Back-Up Camera, Turbocharged, iPod/MP3 Input, Bluetooth MP3 Player, Keyless Entry, Steering Wheel Controls, Electronic Stability Control, Heated Mirrors. OPTION PACKAGES WHEELS: 17 X 7.0 FORGED ALUMINUM HYPER BLACK Tires: 205/40R17XL BSW 3 Season, TRANSMISSION: 6-SPEED AISIN F21-250 HD AUTOMATIC 3.502 Final Drive Ratio, GVWR: 3,500 lbs, Leather Wrapped Shift Knob, POPULAR EQUIPMENT PACKAGE ATC Air Conditioning w/Micron Filter, Heated Front Seats, For More Info, Call 800-643-2112, 1-Yr SiriusXM Radio Service, SiriusXM Satellite Radio, BEATS AUDIO PACKAGE For More Info, Call 800-643-2112, Beats Premium Audio System, 1-Yr SiriusXM Radio Service, SiriusXM Satellite Radio, GPS NAVIGATION. EXPERTS ARE SAYING TheCarConnection.com explains Style is where the 2018 Fiat 500 shines, and it looks like no other car on the road.. Great Gas Mileage: 33 MPG Hwy. BUY FROM AN AWARD WINNING DEALER Central Maine Motors Auto Group has been proudly serving the community since 1935. We do not charge documentation fees, we provide a full tank of gas whether you choose to purchase a new or pre-owned vehicle as well as complimentary, lifetime Maine State Inspections. Please confirm the accuracy of the included equipment by calling us prior to purchase. 3rd Row Seat, CD Player, Keyless Start, Dual Zone A/C, ENGINE: 3.6L V6 24V VVT, PREMIUM GROUP, TRANSMISSION: 6-SPEED AUTOMATIC 62TE. Contusion Blue Pearl Coat exterior, SE trim. FUEL EFFICIENT 24 MPG Hwy/16 MPG City! READ MORE! KEY FEATURES INCLUDE Third Row Seat, All Wheel Drive, Rear Air, Back-Up Camera, iPod/MP3 Input, CD Player, Keyless Start, Dual Zone A/C MP3 Player, Privacy Glass, Keyless Entry, Child Safety Locks, Steering Wheel Controls. OPTION PACKAGES PREMIUM GROUP Interior Observation Mirror, Power 4-Way Driver Lumber Adjust, Leather Wrapped Shift Knob, Leather Wrapped Steering Wheel, Power 6-Way Driver Seat, Security Alarm, ENGINE: 3.6L V6 24V VVT (STD), TRANSMISSION: 6-SPEED AUTOMATIC 62TE (STD). EXPERTS ARE SAYING The ride was controlled on undulating pavement, and it didn't get harsh even on the truly rough stuff. The Journey feels solid and secure on the freeway and would make a good long-distance vehicle. -Edmunds.com. Great Gas Mileage: 24 MPG Hwy. BUY FROM AN AWARD WINNING DEALER Central Maine Motors Auto Group has been proudly serving the community since 1935. We do not charge documentation fees, we provide a full tank of gas whether you choose to purchase a new or pre-owned vehicle as well as complimentary, lifetime Maine State Inspections. Please confirm the accuracy of the included equipment by calling us prior to purchase. Heated Leather Seats, Bluetooth, Keyless Start, Aluminum Wheels, TRANSMISSION: 6-SPEED AISIN AUTOMATIC... CONVENIENCE GROUP, Turbo Charged Engine. Brillante White exterior, Lusso trim. FUEL EFFICIENT 35 MPG Hwy/26 MPG City! CLICK NOW! KEY FEATURES INCLUDE Leather Seats, Heated Driver Seat, Back-Up Camera, Turbocharged, Satellite Radio, iPod/MP3 Input, Bluetooth, Aluminum Wheels, Keyless Start, Heated Seats, Heated Leather Seats. MP3 Player, Keyless Entry, Steering Wheel Controls, Electronic Stability Control, Bucket Seats. OPTION PACKAGES CONVENIENCE GROUP Universal Garage Door Opener, Rear View Auto Dim Interior Mirror, Blind Spot & Cross Path Detection, Heated Exterior Mirrors, Auto Dim Exterior Mirrors, ParkSense Rear Park Assist System, Security Alarm, TRANSMISSION: 6-SPEED AISIN AUTOMATIC Leather Wrap Automatic Shift Knob. EXPERTS ARE SAYING Great Gas Mileage: 35 MPG Hwy. WHY BUY FROM US Central Maine Motors Auto Group has been proudly serving the community since 1935. We do not charge documentation fees, we provide a full tank of gas whether you choose to purchase a new or pre-owned vehicle as well as complimentary, lifetime Maine State Inspections. Please confirm the accuracy of the included equipment by calling us prior to purchase. FUEL EFFICIENT 23 MPG Hwy/16 MPG City! Back-Up Camera, iPod/MP3 Input, 4x4, QUICK ORDER PACKAGE 22J EXPRESS, POPULAR EQUIPMENT GROUP, Alloy Wheels, ENGINE: 3.6L V6 24V VVT. Granite Crystal Met. Clear Coat exterior, Express trim CLICK NOW! KEY FEATURES INCLUDE 4x4, Back-Up Camera, iPod/MP3 Input, Aluminum Wheels MP3 Player, Privacy Glass, Child Safety Locks, Heated Mirrors, Electronic Stability Control. OPTION PACKAGES QUICK ORDER PACKAGE 22J EXPRESS Engine: 3.6L V6 24V VVT, Transmission: 8-Speed Automatic (845RE), Front Fog Lamps, Ram 1500 Express, Body Color Grille, Body Color Rear Bumper w/Step Pads, Rear Floor Mats, Body Color Front Fascia, Front Floor Mats, POPULAR EQUIPMENT GROUP Remote Keyless Entry w/All-Secure, SiriusXM Satellite Radio, For More Info, Call 800-643-2112, No Satellite Coverage w/AK/HI/PR/VI/GU, 1-Year SiriusXM Radio Service, ENGINE: 3.6L V6 24V VVT (STD), TRANSMISSION: 8-SPEED AUTOMATIC (845RE) (STD). EXPERTS REPORT Strong driving dynamics make the Ram 1500 Classic one of the best-to-drive vehicles on the road. it has excellent steering and handling. -Edmunds.com. Great Gas Mileage: 23 MPG Hwy. MORE ABOUT US Central Maine Motors Auto Group has been proudly serving the community since 1935. We do not charge documentation fees, we provide a full tank of gas whether you choose to purchase a new or pre-owned vehicle as well as complimentary, lifetime Maine State Inspections. Please confirm the accuracy of the included equipment by calling us prior to purchase. FUEL EFFICIENT 23 MPG Hwy/16 MPG City! 4x4, Aluminum Wheels, iPod/MP3 Input, Back-Up Camera, TRANSMISSION: 8-SPEED AUTOMATIC (845R... QUICK ORDER PACKAGE 22J EXPRESS, Hitch. Bright White Clear Coat exterior, Express trim CLICK NOW! KEY FEATURES INCLUDE 4x4, Back-Up Camera, iPod/MP3 Input, Aluminum Wheels. MP3 Player, Privacy Glass, Child Safety Locks, Heated Mirrors, Electronic Stability Control. OPTION PACKAGES QUICK ORDER PACKAGE 22J EXPRESS Engine: 3.6L V6 24V VVT, Transmission: 8-Speed Automatic (845RE), Front Fog Lamps, Ram 1500 Express, Body Color Grille, Body Color Rear Bumper w/Step Pads, Rear Floor Mats, Body Color Front Fascia, Front Floor Mats, POPULAR EQUIPMENT GROUP Remote Keyless Entry w/All-Secure, SiriusXM Satellite Radio, For More Info, Call 800-643-2112, No Satellite Coverage w/AK/HI/PR/VI/GU, 1-Year SiriusXM Radio Service, ADD CLASS IV RECEIVER HITCH, RADIO: UCONNECT 3.0 Integrated Voice Command w/Bluetooth, TRANSMISSION: 8-SPEED AUTOMATIC (845RE) (STD), ENGINE: 3.6L V6 24V VVT (STD). EXPERTS ARE SAYING Strong driving dynamics make the Ram 1500 Classic one of the best-to-drive vehicles on the road. it has excellent steering and handling. -Edmunds.com. Great Gas Mileage: 23 MPG Hwy. WHY BUY FROM US Central Maine Motors Auto Group has been proudly serving the community since 1935. We do not charge documentation fees, we provide a full tank of gas whether you choose to purchase a new or pre-owned vehicle as well as complimentary, lifetime Maine State Inspections. Please confirm the accuracy of the included equipment by calling us prior to purchase. Nav System, Moonroof, Third Row Seat, Heated Leather Seats, Back-Up Camera, iPod/MP3 Input, TRANSMISSION: 6-SPEED AUTOMATIC 62TE, NAV & SUN GROUP. Crossroad trim, Pitch Black Clear Coat exterior. EPA 24 MPG Hwy/16 MPG City! CLICK NOW! KEY FEATURES INCLUDE Leather Seats, Third Row Seat, All Wheel Drive, Rear Air, Back-Up Camera, iPod/MP3 Input, Bluetooth, CD Player, Aluminum Wheels, Dual Zone A/C, Heated Leather Seats. MP3 Player, Privacy Glass, Keyless Entry, Steering Wheel Controls, Child Safety Locks. OPTION PACKAGES NAV & SUN GROUP SiriusXM Travel Link, 5-Year SiriusXM Travel Link Service, 5-Year SiriusXM Traffic Service, Power Express Open/Close Sunroof, Garmin Navigation System, ParkSense Rear Park Assist System, SiriusXM Traffic, Radio: Uconnect 3 Nav w/8.4 Display, POPULAR EQUIPMENT GROUP Heated Front Seats, Universal Garage Door Opener, Remote Start System, Heated Steering Wheel, Security Alarm, ENGINE: 3.6L V6 24V VVT (STD), TRANSMISSION: 6-SPEED AUTOMATIC 62TE (STD). EXPERTS ARE SAYING Edmunds.com's review says The ride was controlled on undulating pavement, and it didn't get harsh even on the truly rough stuff. The Journey feels solid and secure on the freeway and would make a good long-distance vehicle.. Great Gas Mileage: 24 MPG Hwy. WHY BUY FROM US Central Maine Motors Auto Group has been proudly serving the community since 1935. We do not charge documentation fees, we provide a full tank of gas whether you choose to purchase a new or pre-owned vehicle as well as complimentary, lifetime Maine State Inspections. Please confirm the accuracy of the included equipment by calling us prior to purchase. Sunroof, Heated Seats, Navigation, iPod/MP3 Input, Dual Zone A/C, Smart Device Integration, Back-Up Camera, DRIVER CONVENIENCE GROUP, TRANSMISSION: 8-SPEED AUTOMATIC (850R... POWER SUNROOF. SXT trim, TorRed Clear Coat exterior. AND MORE! KEY FEATURES INCLUDE All Wheel Drive, Back-Up Camera, iPod/MP3 Input, Dual Zone A/C, Smart Device Integration. MP3 Player, Keyless Entry, Steering Wheel Controls, Electronic Stability Control, Bucket Seats. OPTION PACKAGES POWER SUNROOF, DRIVER CONVENIENCE GROUP Universal Garage Door Opener, Front Fog Lamps, Remote Start System, Blind Spot & Cross Path Detection, Power Multi-Function Foldaway Mirrors, High Intensity Discharge Headlamps, ParkSense Rear Park Assist System, UCONNECT 4C NAV W/8.4 DISPLAY SiriusXM Travel Link, 5-Year SiriusXM Travel Link Service, 5-Year SiriusXM Traffic Service, SiriusXM Traffic Plus, GPS Navigation, BLACKTOP PACKAGE Black Grille w/Bezel, Wheels: 19 x 7.5 Black Noise Painted, Front Fog Lamps, Gloss Black I/P Cluster Trim Rings, Black Fuel Filler Door, Leather Performance Steering Wheel, AWD Rhombi Black Badge, Challenger Blacktop Grille Badge, Rear Black Spoiler, COLD WEATHER GROUP Heated Front Seats, 180 Amp Alternator, Heated Steering Wheel, TRANSMISSION: 8-SPEED AUTOMATIC (850RE) (MAKE) (STD), ENGINE: 3.6L V6 24V VVT (STD). EXPERTS RAVE Muscle cars are also known for their lack of practicality, but the Challenger bucks that trend. thanks to its large trunk and relatively spacious rear seats. Compared to the Chevrolet Camaro and the Ford Mustang, the Challenger is downright sensible. -Edmunds.com. BUY FROM AN AWARD WINNING DEALER Central Maine Motors Auto Group has been proudly serving the community since 1935. We do not charge documentation fees, we provide a full tank of gas whether you choose to purchase a new or pre-owned vehicle as well as complimentary, lifetime Maine State Inspections. Please confirm the accuracy of the included equipment by calling us prior to purchase. NAV, Heated Leather Seats, Bluetooth, Keyless Start, iPod/MP3 Input, TRANSMISSION: 6-SPEED AISIN AUTOMATIC... NAVIGATION & SOUND GROUP. Hypnotique Red exterior, Elaborazione Abarth trim. FUEL EFFICIENT 35 MPG Hwy/26 MPG City! CLICK ME! KEY FEATURES INCLUDE Leather Seats, Heated Driver Seat, Back-Up Camera, Turbocharged, Satellite Radio, iPod/MP3 Input, Bluetooth, Aluminum Wheels, Keyless Start, Heated Seats, Heated Leather Seats. MP3 Player, Keyless Entry, Steering Wheel Controls, Electronic Stability Control, Bucket Seats. OPTION PACKAGES CONVENIENCE GROUP Universal Garage Door Opener, Rear View Auto Dim Interior Mirror, Blind Spot & Cross Path Detection, Heated Exterior Mirrors, Auto Dim Exterior Mirrors, ParkSense Rear Park Assist System, Security Alarm, TRANSMISSION: 6-SPEED AISIN AUTOMATIC Leather Wrap Automatic Shift Knob, Steering Wheel Paddle Shifters, NAVIGATION & SOUND GROUP 9 Bose Speakers w/Subwoofer, GPS Navigation. EXPERTS RAVE Great Gas Mileage: 35 MPG Hwy. WHY BUY FROM US Central Maine Motors Auto Group has been proudly serving the community since 1935. We do not charge documentation fees, we provide a full tank of gas whether you choose to purchase a new or pre-owned vehicle as well as complimentary, lifetime Maine State Inspections. Please confirm the accuracy of the included equipment by calling us prior to purchase. 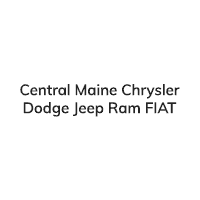 When you want to buy a new car in Maine, turn to the experts: Central Maine Chrysler Dodge Jeep Ram FIAT®! Here at our Jeep dealership in Waterville, ME, we have a wide variety of all your favorite vehicles from Chrysler, Dodge, Jeep, Ram and FIAT for sale. Come to our dealership to shop for a new sedan, and we’ll show you popular models like the Chrysler 300 and sportier Dodge Charger. Need a new SUV? Be sure to check out our inventory of new Jeep Grand Cherokee and Jeep Wrangler models. If you’re looking at new trucks or commercial vehicles, we have the Ram 1500 and Ram 2500. We even have family-friendly Chrysler Pacifica and Dodge Grand Caravan minivans for sale, and bold new FIAT 500 cars. No matter what you need for your fast-paced lifestyle, you’ll find it at our Waterville Ram, Dodge, Jeep, Chrysler and FIAT dealership.